A British-led team has recovered $50m (£34m; €47m) worth of silver coins from the ocean floor, more than 70 years after the steamship carrying them from Bombay to England was torpedoed by a German U-boat. The SS City of Cairo was hit 772km (480 miles) south of St Helena in the Atlantic Ocean and sank to a depth of 5,150m. 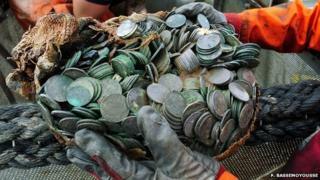 The effort to raise the 100 tonnes of coins, which belonged to HM Treasury, is the deepest salvage operation in history. The silver rupees were called in by London in 1942 to help fund the war effort but they never made it to Whitehall's coffers. On 6 November a prowling U-boat spotted the steamship's tall plume of smoke and fired off a torpedo. Ten minutes later, amid efforts to abandon ship, a second torpedo hit the City of Cairo and sealed its fate. The ship and its cargo was presumed lost until 2011, when a team led by British salvage expert John Kingsford located an unnatural object among the ridges and canyons of their South Atlantic search area. "We weren't convinced at first," he said. "But you have to give your team their head if they say they've found something, so we looked." The object was indeed the City of Cairo, and the team recovered a "large percentage" of its £34 million treasure chest. "There was a lot a relief all round," Mr Kingsford said. As well as the coins, the team brought up the propeller belonging to the second, fatal torpedo. Shortly after that second torpedo struck 73 years ago, and the last remnants of the City of Cairo disappeared beneath the waves, the U-boat surfaced and approached the survivors' lifeboats. Its captain, Karl-Friedrich Merten, famously directed them to the nearest land and said: "Goodnight. Sorry for sinking you." Only six of 311 people aboard died in the sinking, but it would be three weeks before anyone found any of the six lifeboats that had set out for land. In that time, 104 of the 305 survivors died. The British SS Clan Alpine picked up 154 survivors alive on the way to St Helena and a further 47 were rescued by a British merchant ship, the Bendoran, and taken to Cape Town. A final lifeboat was discovered 51 days after the sinking, off the coast of South America, with only two of its many passengers alive. In a cruel twist of fate, one of the two men, Third Officer James Allister Whyte, died shortly after when the ship taking him home was torpedoed by a U-boat. After leaving the wreck for the final time, the divers left a plaque in honour of those who died which read: "We came here with respect." "It was a special salvage," Mr Kingsford said. "It does mean a lot...It was a very emotive case, where over a hundred people were lost having been in open boats. "It meant a lot to our team to find this ship and remember it."